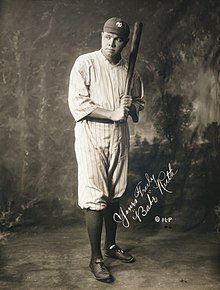 Georgius Hermannus "Babe" Ruth iunior (vulgo George Herman "Babe" Ruth, Jr.; Baltimorae natus 6 Februarii 1895, mortuus 16 Augusti 1948) fuit lusor basipilae qui duos et viginti annos, ab anno 1914 ad annum 1935 in foedere maiori basipilae [en] lusit. Primum fuit bonus iaculator manus sinistrae in Boston Red Sox, sed deinde gloriam in New York Yankees clavator firmissimus et defensor campi exterioris consecutus est, saepe cognominibus The Bambino (Puerulus) et The Sultan of Swat (Sultanus incussús) appellatus. Multos novos cumulos clavatoris, nonnullos quoque iaculatoris attingit, hi fuerunt cursús domum in vita facti (HR) (714), cursús a clavatore creati (RBI) (2213), bases post pilas vocatas (BB), (2062), centesimae incussús firmorum (SLG) (.690) ac centimae presentiae in base et incussús firmorum (OPS) (1.164); duo cumuli postremi etiamnunc stant. Ruth unus ex maximis heroibus artis athleticae Americanae habetur; saepe maximus lusor historiae basipilae appellatur. Unus fuit ex primis quinque lusoribus anno 1936 in Aulam famae basipilae nationalis inductis. Ruth, annos septem natus, ad Scholam industrialem puerorum Sanctae Mariae missus est, scholam ad pueros corrigendos destinatam, ubi praecepta vitae et basipilae artes a fratre Matthia Boutlier, disciplinae coercitore et perito basipilae lusore, didicit. Anno 1914, a Baltimore Orioles, manipulo foederum minorum, conductus, mox autem manipulo Red Sox venditus est. Appel, Marty. Pinstripe Empire: The New York Yankees From Before the Babe to After the Boss. Novi Eboraci: Bloombury, 2012. ISBN 978-1-60819-492-6. Creamer, Robert W. Babe: The Legend Comes to Life. First Fireside ed. Novi Eboraci: Simon & Schuster, 1992 . ISBN 0-671-76070-X. Graham, Frank. The New York Yankees: An Informal History. Novi Eboraci: G. P. Putnam's Sons, 1943. OCLC 1825210. James, Bill. The New Bill James Historical Baseball Abstract. First Free Press trade paperback ed.). Novi Eboraci: Free Press, 2003 . ISBN 978-0-7432-2722-3. Montville, Leigh. The Big Bam: The Life and Times of Babe Ruth. Novi Eboraci: Broadway Books, 2006. ISBN 978-0-7679-1971-5. Neyer, Rob. 2000. Rob Neyer's Big Book of Baseball Blunders. Novi Eboraci: Fireside Books. ISBN 0-7432-8491-7. Peluso, Ralph. 2014. 512. Farmington in Missuria: Solstice Publishing. ISBN 978-1625261342. Pietrusza, David. 1998\. Judge and Jury: The Life and Times of Judge Kenesaw Mountain Landis. South Bend in Indiana: Diamond Communications. ISBN 978-1-888698-09-1. Reisler, Jim. 2004. Babe Ruth: Launching the Legend. Novi Eboraci: McGraw-Hill. ISBN 0-07-143244-2. Sherman, Ed. 2014. Babe Ruth's Called Shot: The Myth and Mystery of Baseball's Greatest Home Run. Guilford in Connecticuta: Lyons Press. ISBN 978-0-7627-8539-1. Smelser, Marshall. 1975. The Life That Ruth Built. Novi Eboraci: Quadrangle/New York Times Book Co.. ISBN 0-8129-0540-7. Spatz, Lyle, et Lyle Steinberg. 2010. 1921: The Yankees, The Giants, & The Battle For Baseball Supremacy in New York. Lincolniae in Nebrasca: University of Nebraska Press. ISBN 978-0-8032-3999-9. Stout, Glenn. 2002. Yankee Century: 100 Years of New York Yankees Baseball. Novi Eboraci: Houghton Mifflin. ISBN 0-618-08527-0. Wagenheim, Kal. 1974. Babe Ruth: His Life and Legend. Novi Eboraci: Praeger Publishers. ISBN 0-275-19980-0. Novissima mutatio die 30 Septembris 2016 hora 11:37 facta.